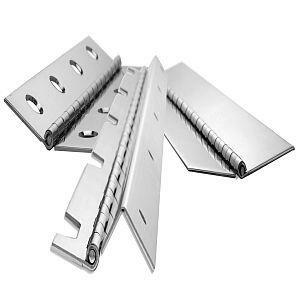 S & S HINGE COMPANY, Feronerie industriala, piano hinges, continuous piano hinges, pe EUROPAGES. 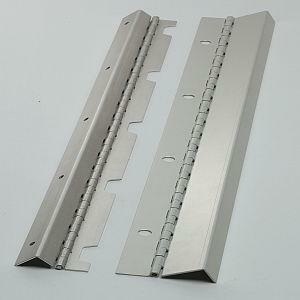 The S & S HINGE Company (E-Commerce - Buy Online - www.SandSHinge.com) is a third generation Lean continuous piano hinge manufacturer (Est. 1932). We manufacture the mid-range gauges (.035, .040, .050, .060, and .070) of continuous piano hinge in steel, stainless, aluminum, bright-annealed stainless, brass pre-plate, and nickel pre-plate. We can customize our standard continuous piano hinges with Value-Added options including: Cut-to-length, hole punching, forming, swaging, offsetting, staking, and many other Value-Added fabrications and post-finishes. S & S stands for "Savings and Service" - the old-fashioned values on which our founders built the business 85 years ago. Today, that means: Free new-product development, free engineering assistance and free engineered samples/prototypes, new State-of-the-Art ERP/MRP Lean process management systems provide shorter average lead times, certified TQM program assures 100% defect-free parts, and inventory management programs covering all inventory-flow types (ex: JIT, Kanban, etc. ).